How to get import licence in UK? How to start an import business in UK? What are the certification formalities to import to UK? 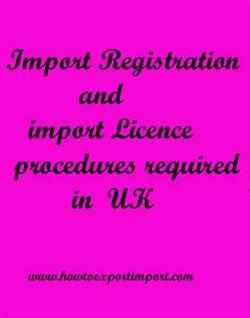 What are the procedures for registration as an importer in UK? This post explains about import registration procedures to be obtained from UK government authority for importation to UK. The Department for International Trade (DIT) is a United Kingdom government division in charge of striking and expanding trade agreements between the United Kingdom and non EU states. UK is a member state of the European Union at the moment, but is planning on leaving after Brexit was voted for. The European Union (EU) is an economic and political union of 28 countries. It operates an internal (or single) market which allows free movement of goods, capital, services and people between member states. The United Kingdom's main trade partner is the EU. There will be no change to the rights and status of EU nationals living in the UK, nor UK nationals living in the EU, while the UK stays in the EU. While moving products from European Union (EU) nations, the shipper required to get a commodity code and pay VAT, however not import duty. You won't as a rule require an import permit for imports from the EU. In any case, a few merchandise like guns or national restricted products may requests one. Since UK falls under EU countries, a common trade policy is adopted to import most of the products. A separate rules and regulations are applied to specific products when importing and exporting in the European Union called Integrated Tariff of the European Communities (TARIC code). For any import, export or transit in EU countries, an EORI number is compulsory. EORI means Economic Operator Registration and Identification. The European Union (EU) legislation has required all member states to adopt the Economic Operators Registration and Identification (EORI) scheme. All importers, exporters and other transporters need to use a unique EORI reference number in all electronic communications with Customs and other government agencies involved in the international trade. This means that anyone involved with export, transit or import operations need to have EORI number. This information is about import licensing procedures to import goods to UK. If you have to add more information about import permit and registration required to import goods to UK, share below your thoughts. Import registration procedures required in Birmingham. Import Licence process in Bournemouth. Process to import to Bristol. Requirements of registration to import to Cardiff. Registration requirements in Doncaster/Sheffield to import. Registration needed to import to Middlesbrough. How can I register to import in Nottingham/Leicester. What Licence requited to import in Exeter. What should I do to import goods in Leeds/Bradford. How to get import licence in Liverpool. Procedure to get registration to import in London. Mandatory process need to complete import in Norwich. First permission required to import in Southampton. How can I start import business Newquay?. How to begin import trade in Newcastle upon Tyne? Permission to initiate to import in Manchester. The way to get registration to import in Newcastle upon Tyne.